Flattened radial aggregates of fine prismatic crystals showing a very deep blue color and a very good luster. 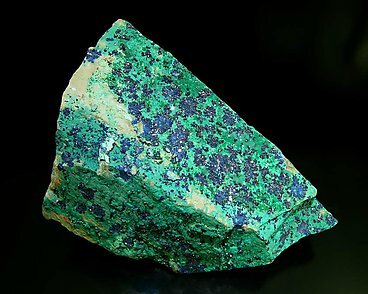 They are on a rocky matrix with green surficial staining of an unidentified secondary mineral of copper. 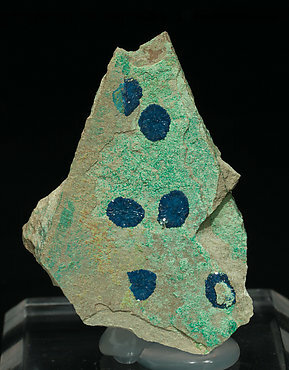 A classic of the mineralogy from the type locality for the species. Crystals are very bright and appear in radial groups. Some of these groups are deep uniform marine blue, some others have a clearer blue in zones near the center and are deeper on the edges. We call attention on the contrast with the deep green color of the Malachite base.